I was fortunate enough to be part of a webinar organized by Steve Cunningham with Tara Hunt. Tara presented the ideas in her book, The Whuffie Factor and I got to share a few ideas about how to use Whuffie for good. This is one of the biggest reasons I don’t like to measure Whuffie. I get the question time and time again when I talk about the book. The question I *should* be getting is ‘what can I do with my Whuffie?’. We should be less concerned about how many followers one has and more about what that person does with that many followers. Not only is Whuffie left better in the non-fungible, ephemeral realm, but it is inconsequential. The measure needs to be in the impact. If we concentrate on our influence, we forget the end goal. We get caught up in our ego. Focus on the big prize. All too many times, people stop at the influence part: how popular is that person? how many followers do we have? who is talking about me and my company? how much love do people feel for me? While she was talking, I thought about the diagram I had just finished in the book I'm co-writing with Allison Fine. 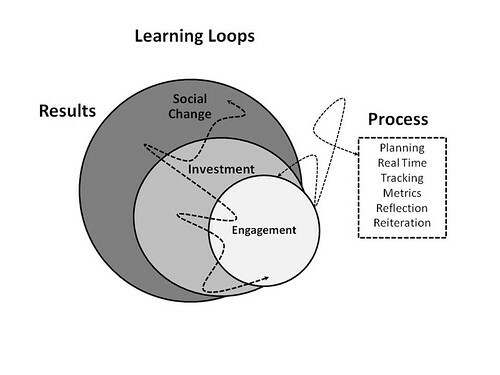 The chapter is called learning loops is about tracking and reflection. We make the point that the focus should be on the impact or the change in the real world. In early October, I had approximately 20,000 Twitter followers and today that number is almost ten fold. In October, I was placed on the Twitter Recommended User list along with a handful of other nonprofit and philanthropy Twitter users. I tried to leverage this for other nonprofit/charity Twitters by adding lists of Twitter users to my Twitter landing page. There's no way to maintain strong ties with that many people with such fast growth. So, the point here is that numbers in social media don't matter as much building relationships one person at a time. A lot of followers doesn't equal influence. 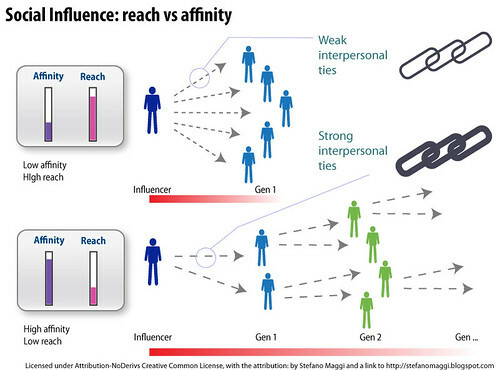 As Stefano Maggi points out, there's more to influence besides numbers, there is also affinity. Geoff Livingston put it another way: relationships matter more than numbers with Twitter following. We did an experiment to prove our point. The bottom line is to focus on the results of your social media strategy, don't get distracted by meaningless metrics like the number of followers, and value the relationships. Excellent post! Completely agree with all the points you've made here. The reason many cling to the "meaningless" metrics is because it's so easy to do but quality of relationships/engagement is ignored because it's not easy to measure. Traditional marketing has always been about influence and numbers rather than conversations and relationships, which explains the focus on the wrong metrics. The true value of social media lies in the individual/1:1 relationships and not in the numbers, as you've pointed out. Been thinking a lot about this recently (obviously!) and think that we need to be careful about boxing ourselves into an either/or scenario. Having a lot of followers or friends or readers does not automatically connote influence, but creates the opportunity for it. As you rightly state that influence is not an end point but a point along the continuum of change. 1. As you've discovered on Twitter, there is a power in more. 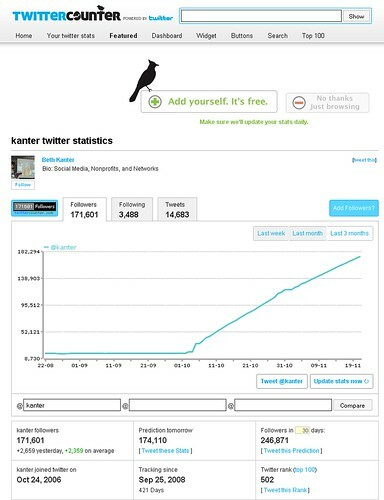 More followers creates more followers - it's a gravitational pull. 2. A larger following creates the possibility of more people listening and talking and doing more for social change. There's another reason why the size of the following is so important through social media. Because it cuts across boundaries that previously restricted women and people of color from participating. You, as an individual, have built a substantial following in a way that you could never have done before social media alone. It enables new voices to be heard, like mommy bloggers, at a volume that was previously impossible to amplify. You are absolutely right that ultimately what a person does with that influence is what counts. However, the influence begins before the action. So, it's a "both/and" not an "either/or". If you click through to link to the experiment that Geoff and I did, you'll see the theory may not pan. 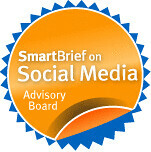 In my case, the followers were added from the Twitter SUL - not through relationship building. I don't have the capacity to know the followers, network weave, - its beyond the dunbar number. That doesn't create social capital. Yesterday on Twitter, Kathy Sierra had a couple of really insightful points - she said that the number isn't necessarily meaningless. A very clarifying point - that the number is meaningless unless there is CONTEXT. Why is the number of followers increasing? or decreasing? What insights does that provide?